Cally Weston, food writer and columnist finds out she’s pregnant just after her fiancé Adam Scott walks out on her to do a long stint in the Antarctic as a marine biologist and with someone else to keep him warm. Cally tells Adam that she’s expecting his baby but he makes it quite clear that if she goes ahead with the pregnancy she will have to do it alone. She resigns herself to this and adapts her life appropriately – until her baby is born with a life threatening heart defect. Cally struggles through operations and regular hospital visits with baby, Stella, who has always been very sick and prone to illness, but doctors say there is no more they can do to help her, apart from palliative care. As any parent Cally is determined to find something to help her toddler and contacts a doctor in the US who is willing to try some experimental surgery on her. Cally thinks long and hard but decides that realistically it is Stella’s only hope, however she has no idea how she will fund it even with the surgeon kindly offering his services for free. She sells their London home which and moves to her eccentric mother’s cottage in the Lancashire village of Sticklepond where she hopes to raise the shortfall left from the proceeds of their home. The community soon embrace her and Stella as their own and the fundraising group “Stella’s Stars” is formed. She finds an instant connection when she meets patissiere, Jago Tremayne and soon finds herself falling in love, but with Stella’s life hanging in the balance she knows she cannot commit, and certain dark shadows from both of their pasts seem hellbent on stirring trouble. 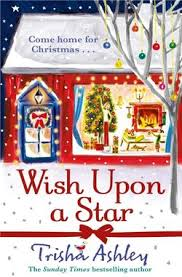 Ashley has captured true magic in Wish Upon a Star, the gentle romance and fierce mother’s love; along with the wonderful community spirit echoes the beautiful meaning of Christmas. I loved watching Jago and Cally build such a close bond, and of course share a knowledgeable passion of cake! The recipes that Cally mentions and features in her column gave me lots of baking inspiration myself! The characters are all wonderful and well thought out, and the subplots all give the story an extra sparkle, I especially loved the rebuild of Miss. Honey’s shop and her quick witted character itself. All in all a really fabulous read!